Over the past year or so, I've fallen in love with grits. A traditional Southern comfort food, I think that they've surpassed mashed potatoes as one of my favorite foods. They can be made in 5 minutes, and I've come up with the perfect vegan version. I cook the grits in salted water, and then I whisk in a tablespoon or two of almond milk, a tablespoon of Earth Balance buttery spread, and two tablespoons of nutritional yeast in the last 2 minutes of cooking. The result: creamy, comforting grits. 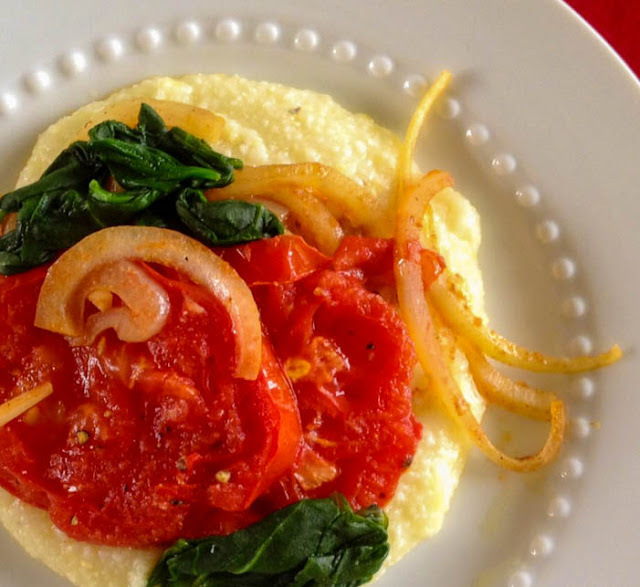 I paired the grits with some sauteed tomatoes, onions, garlic, and spinach in this recipe. 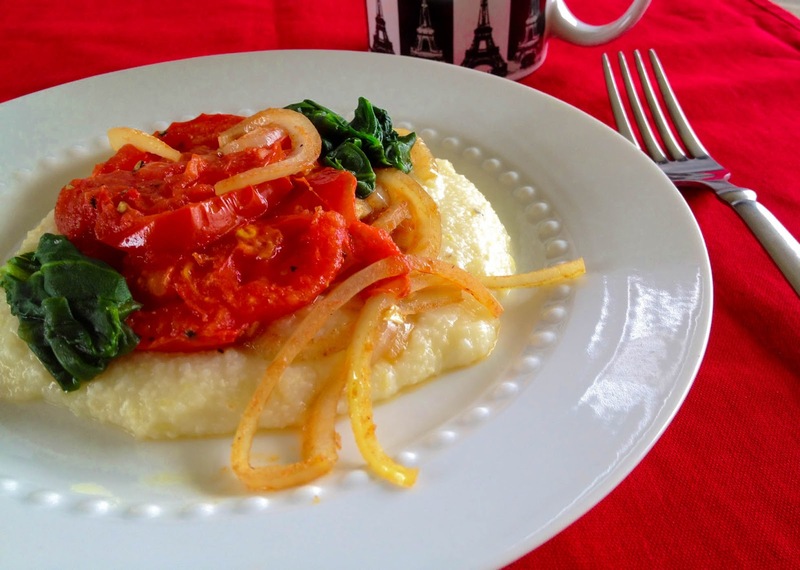 The acidity of the tomatoes combined with the creamy and savory grits creates a lovely marriage of flavors, while the onions and garlic lend the perfect amount of umami flavor. Pair this recipe with mimosas, and I guarantee a delicious Sunday brunch. Happy Sunday! Serves 2 of me, but serves 4 people with normal appetites. Total Cook Time: about 20 minutes. 1. In a medium saucepan, bring the water and a dash of salt to a boil. Whisk in the grits, cover, reduce heat to low, and cook for 5 minutes, stirring when necessary. 2. Next, whisk in the almond milk, buttery spread, and nutritional yeast. Let cook on low for another 2 minutes or so. 3. Add the onions and garlic to a large skillet. Cook on medium to medium-high heat for 5 minutes. Add the tomatoes, and cook for about 3 minutes on each side. 4. In a small skillet, add a tablespoon or two of water, and the spinach. Cook on medium-high heat until wilted. Drain any remaining water. 5. Serve the tomato mixture and spinach on top of the grits (preferably with mimosas). I have always wondered just what grits are, so it was wonderful to see your photos. I still don't understand them fully (we don't have them in Australia!) but they look beautifully fluffy. Plus, anything with nutritional yeast sounds good to me! Thanks! I honestly just started eating them fairly recently. (They're more of a Southern thing, and I grew up in the north). The first time I had them was at the meal plan buffet my freshman year in college. I wasn't too fond of them then, but I fell in love once I decided to give them a second chance. I love grits also! And I especially love them vegan-style! THis is a serious comfort brunch! Yes! They're super delicious. I may have to make this for my mom for Mother's Day. What a great breakfast! I am always looking for something else to have. Thanks Colynn. Aw thanks Ginny. It is nice to have a different breakfast option that's easy to make.